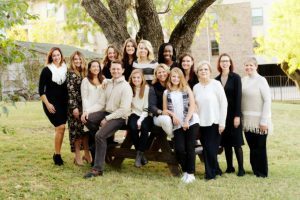 Mom’s Best Friend is your trusted Dallas / Fort Worth nanny and babysitter agency. We are your source for wonderful, screened caregivers when you need to hire a nanny, newborn care specialist, babysitter, or other household staff. We match your family with the best candidates available, all of whom are experienced, kind, and carefully screened through our intensive screening process. Please note that meetings and interviews at our branch office are by appointment only. Take the Sandy Lake/Whitlock Road (Exit 444) and go East on Whitlock. Whitlock will turn into Keller Springs. Continue approximately two miles (through three lights) and turn right at Josey Lane. We are located in the middle office building in the Josey Rancho office complex on the right. You cannot miss the distinctive, historic, red brick buildings. Please come in the front door and we are in Suite 100 (on your left). Get off at the Josey Lane Exit and go South until you reach Keller Springs. We are located on the southwest corner of Josey and Keller Springs. We are located in the middle office building in the Josey Rancho office complex on the right. You cannot miss the distinctive, historic, red brick buildings. Please come in the front door and we are in Suite 100 (on your left).